Every year, with the help of corporate sponsors, Ronald McDonald House Charities® Greater Western Sydney (RMHC® GWS) rolls out the red carpet and organises a fundraising movie night like no other. This year was no exception. Kids and their families had a monstrously good time, taking a deserved afternoon's holiday to a VIP Vmax pre-screening of the much anticipated Hotel Transylvania 3: Monster Vacation. As one of the corporate contributors together with Sony Pictures, Event Cinemas and Coca-Cola Amatil, we're proud to have played a role in making this movie night possible with proceeds from every ticket sold going to RMHC® GWS. 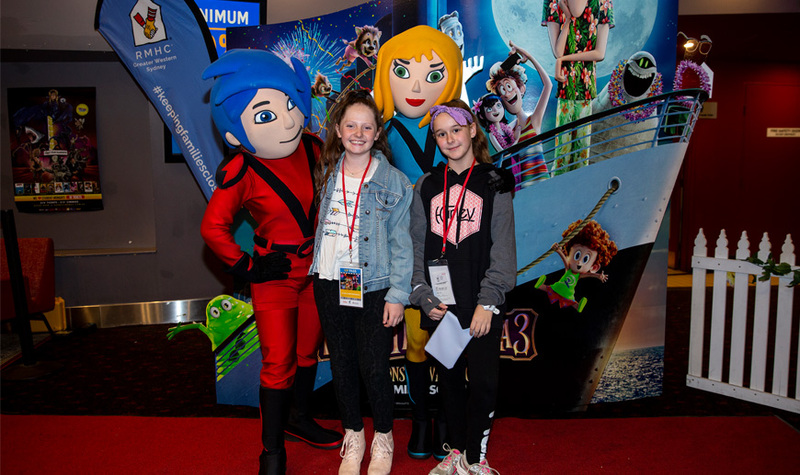 As well as the movie, kids enjoyed an exclusive red carpet experience where Event Cinemas characters joined them for plenty of fun, laughter and horribly good photo opportunities. Our production team customised special event lanyards to help moviegoers identify the cinema and RMHC® GWS staff. We also provided the kids and their families with special VIP Pass keepsake pouches to hold their tickets. Being able to wear the lanyards and tickets made it easier for identification and ticket scanning. Importantly, with VIP Passes taking pride of place around their necks, the children felt super special plus they could keep their tickets safe amidst all the red carpet excitement. Since 1981, RMHC® GWS has been providing a ‘home away from home’ for families of seriously ill children being treated at nearby hospitals. Its mission is to keep families together during their times of need through the provision of accommodation, family holiday retreats and learning programs that help children catch up on missed schooling following a serious illness. With 16 Houses in Australia and more than 360 Houses worldwide, RMHC® GWS relies on fundraising activities and corporate partnerships like these movie nights to maintain its vital facilities. This is our second year of helping to support RMHC® GWS in this capacity, and it gives us enormous pleasure. For more information about RMHC® GWS and how you can help, visit www.rmhc.org.au/westmead.